Amani Guest Lodge - Walmer Accommodation. Amani Guest Lodge, meaning 'place of peace', is designed to emphasize a more authentic African experience, a tranquil retreat with sophisticated simplicity and attention to detail - all creating a myriad of special moments for our guests! Pure relaxation is simply the best 'medicine' that is on offer at Amani Lodge. From the moment you arrive, Amani Guest Lodge beckons you to share warm African hospitality and to relax in understated luxury. 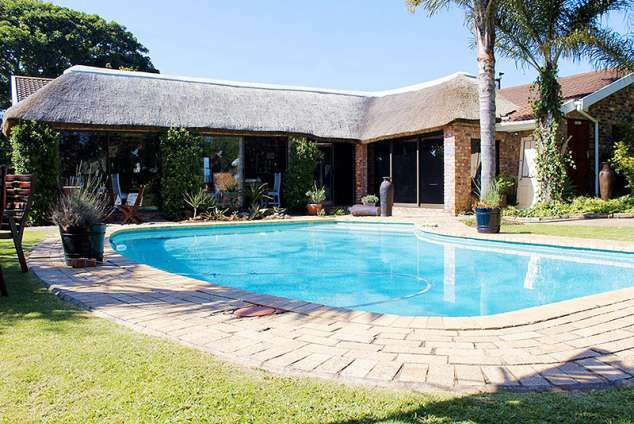 Amani Guest Lodge is ideally located in the beautiful garden suburb of Walmer, which is centrally situated close to the airport, less than five minutes to our popular beaches and within walking distance to a myriad of excellent restaurants in the vicinity. The famous Walmer Park Shopping Centre, which offers a variety of shops, restaurants, cinemas and other entertainment, is only six minutes drive away. Proud owners Carl & Pieter have created a refined haven of comfort where guests are assured of outstanding hospitality and exceptional personal service. Deluxe Double en-suite (full bathroom) Garden and pool view, microwave, DSTV (Hotel Bouquet), Free WiFi, bar fridge, safe, servicing daily. Pool facing family room with full en-suite bathroom, king size bed and a bunk bed for 2 children. Microwave, DSTV (Hotel Bouquet), Free WiFi, bar fridge, tea/ coffee facilities. This Standard Budget Room has been tastefully decorated with oil paintings by the artist "Otto". Cotton Percale linen invite guests to relax in the lap of luxury and comfort. While taking advantage of all the modern amenities on offer. The room is serviced daily which ensures that guests come "home" to a clean, neat and inviting room at the end of a busy day spent exploring Port Elizabeth. From the window of this "back" room, guests can view several old trees and wake up by the sound of birds announcing each new day. The focus of this room is Budget accommodation in comfort. This room has a private entrance. Queen Size Bed / En-suite Bathroom- shower only / Percale Linen / Garden view / Microwave / Bar fridge / Coffee & tea facility / Remote TV / DSTV (Hotel Bouquet) / Ceiling Fan / Daily Servicing. Lovely garden facing double en-suite with shower only, private entrance, microwave, DSTV (Hotel Bouquet), Free WiFi, bar fridge, tea/ coffee facilities. English breakfasts are served in the relaxed breakfast area, which offers a lovely view of the lush tropical garden & swimming pool. Home-cooked evening meals are available by prior arrangement. Guests can also enjoy an evening meal under the stars in the large outdoor BBQ - self-service. Beautifully decorated en-suite bedrooms with oil paintings by the artist "Otto", one of the owners. All rooms have their own entrance overlooking the swimming pool and garden or only the garden. Dining-room & outdoor patio under thatch. Tea/ Coffee making facility in each room. Heaters and ceiling fans in each room. All rooms equipped with 54cm colour TV plus DStv (Hotel Bouquet). From N2: Follow the "Settlers Way" sign and stay on the (M4) all the way to the end of the freeway. Turn right into Walmer Boulevardt (M9) at the traffic lights. Continue until Third Avenue, turn left as if going to the airport and right into Albert road. Pass Plane street on your right and turn right into 4th Avenue. We are the second property on the right. From the airport: Turn left into "Allister Miller", which becomes Third Avenue. Continue past the filing station on your left, over the railway line and turn left (second street) into Albert road. Pass Plane street on your right and turn right into 4th Avenue. We are the second property on the right. Take the Cape Road exit from the N2. Turn right at William Moffet Expressway (M12). Turn left in Main road (M7) and drive till 6th avenue. Turn right in 6th avenue and 4 blocks later turn left in Heugh Road (M9). Turn left and follow till you get 4th avenue. Turn right and guest house 2nd property left. 17445 page views since 22 Feb, 2007.